It was a Friday morning, not just any kind of Friday morning it was the Friday morning we were going to celebrate mass with our Soul - Friends. But the most exciting part is that after morning tea we were going to have Athletics. I was so excited for Athletics. Athletics Day is a day where we all have fun doing different kind of events like running, High Jump, Shot Put and Obstacles Courses. 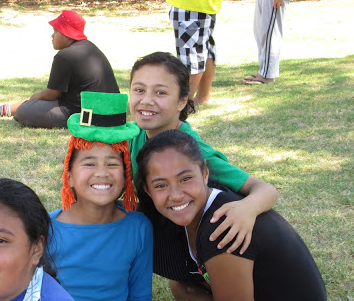 There were 4 teams Geckos, Tuis, Kiwis and Keas. I was in Geckos. We all went in our age groups to different events on the field. The 11 year old went to the Obstacle Courses first. Mrs Pole and Miss Mat were in charge of the Obstacle Course. It came to the last event, running. There was a 50 metre, 75 metre and 100 metre race. I ran my fastest in all my races. Everyone ran and if you came 1st, 2nd or 3rd you get a ribbon. Everybody ran, then we all went back to our gazebos. Now it was time to reveal the winners of Athletics 2013. Mr Coakley announced who came 4th, it was the Keas. In the Geckos gazebo everybody was so nervous. “3rd place is Kiwi’s!” Mr Coakley announced. Now it was only two teams left, The Tuis and The Geckos. “2nd place is........ Tuis” Mr Coakley declared. The Geckos all screamed because that meant we came 1st. Mr Coakley finally said “ 1st place is GECKOS! !” Mr Coakley handed the Shield to Genevieve and Sione Dale.